Organic–inorganic hybrid nano-particles have been synthesized via a modified Stöber method. Nano-particles have been prepared from silica precursors with different organic functionalities. 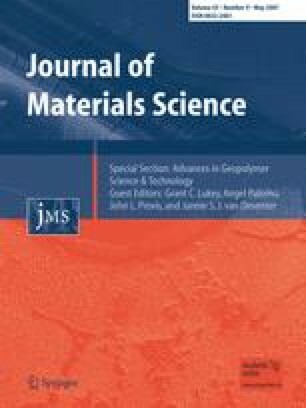 Methyl, ethyl, vinyl and phenyl modified silicas have been synthesized with a view to using these particles as modifiers for polymers and polymer matrix composites. Nano-composites have been produced using polyester as a matrix. The effect of the nano-particles on the toughness of the polyester has been investigated and it is shown that the incorporation of nano-particles leads to an improvement in toughness. For the methyl, ethyl and vinyl ormosils (organically modified silicas) the improvement is minor. The phenyl ormosil gives a greater improvement. This is attributed to different toughening mechanisms.